14k Gold Diamond Bezel Bypass Ring. Available in 14k White, Yellow, or Rose gold. Diamonds in this ring total 1/2ctw. Pear shape diamond is 6x4mm SI2-3 clarity GHI color, bordered with diamonds. Top dimension of this ring 17.4mm across. Ring weighs 3.83grams. 14k Gold Diamond Bypass Ring. Available in 14k White, Yellow, or Rose gold. Top dimension of this ring is 12.27mm across. Striking 14k Gold Asymmetrical design diamond ring. Diamonds total 1/2 ctw in this unique finely crafted ring. Available in 14k White, Yellow, or Rose gold. This is a stackable ring. The larger diamond is a 4.1mm round stone, accents are 1.3mm round each and there are 23 of them. 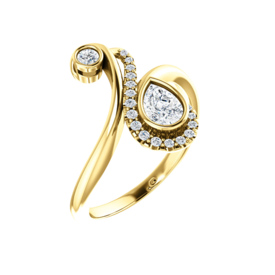 Trendy 14kt gold diamond bypass ring. 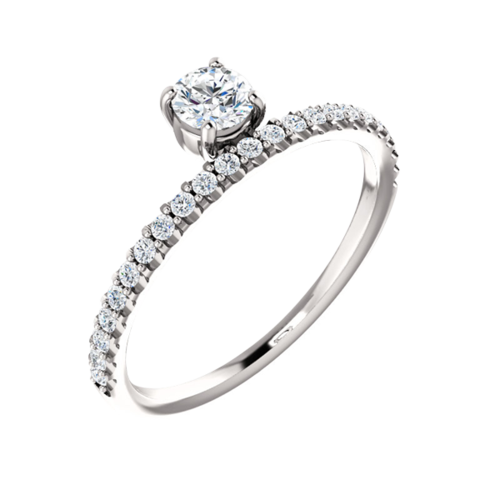 This very popular diamond ring features a 1/8 ct tw round diamond and weighs about 5.43grams. 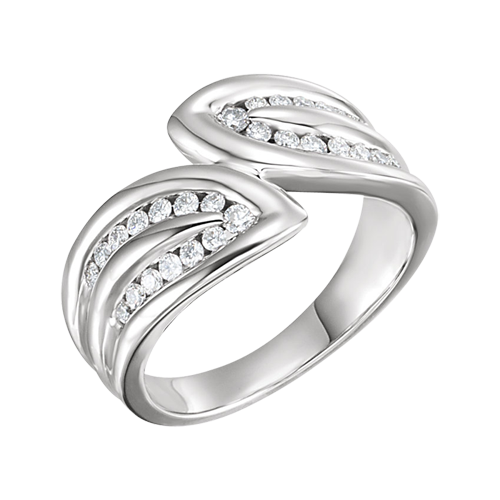 You'll love this stylish modern design diamond ring. Also available in 14k yellow or rose gold. 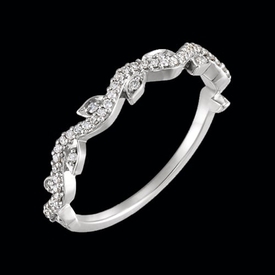 Sophisticated diamond slant design princess ring. 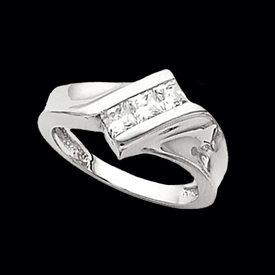 Princess cut diamonds are channel set in this great ring and total .60ct tw. Diamonds are SI 1 clarity G-H color. Clean sharp lines give this ring it's incredible style. Ring is available in 14k white, 14k yellow, 14k rose gold selections and Platinum. Ring weighs 6.30grams. 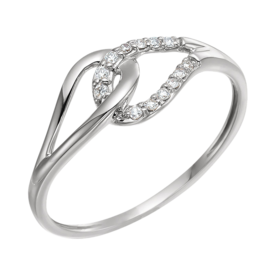 You'll love this polished diamond ring in whatever metal you choose. Like the style but not the diamonds? Have your favorite gemstone set in this ring, it's your ring you design it. 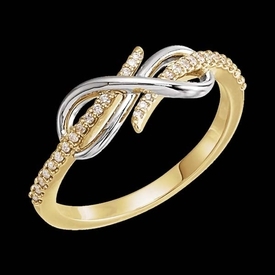 Stunning 14k Gold Diamond accented criss cross ring. This diamond ring is over 1/2 inch wide across the top at 13.6mm. Diamonds total 1/2 carat and are I1 clarity, H+ color. Order this beautiful diamond ring in 14k yellow, 14k white, or 14k rose gold. 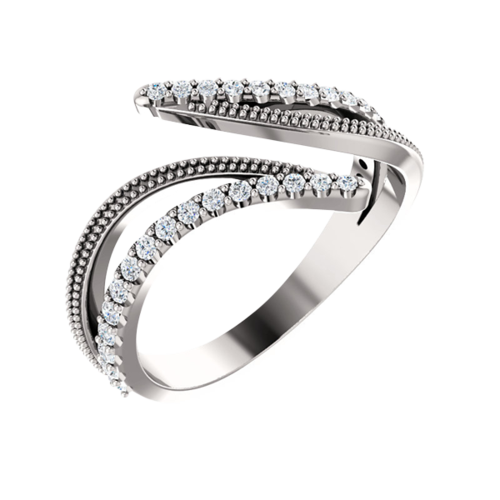 You'll love this diamond ring. Mystical 14k White gold diamond negative space ring. Genuine pear shape diamond weighs 1/3 ct tw and measures about 6x4mm in this lovely refreshingly original diamond ring. 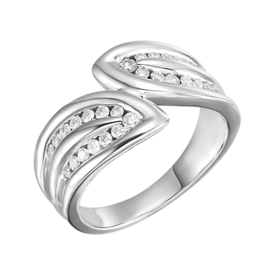 Striking 14k White gold diamond leaf ring. Diamonds total 3/8ctw in this unique leaf style diamond ring. Get a better idea of this rings beauty in the video below. Lovely 14k two tone gold Diamond Infinity style ring. 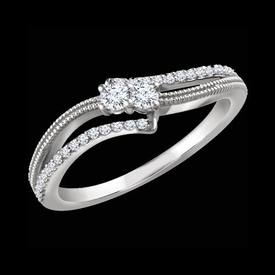 Diamond ring set with 1/8ctw diamonds, this design is a favorite and we're sure you'll love it. 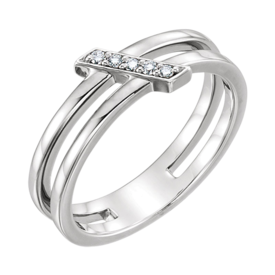 14k Gold Diamond bar design ring. This stylish ring measures 7.3mm wide across the top and about 4.3mm at the shank. Diamonds are 1.3mm round each, really just accents they total .05ctw.. 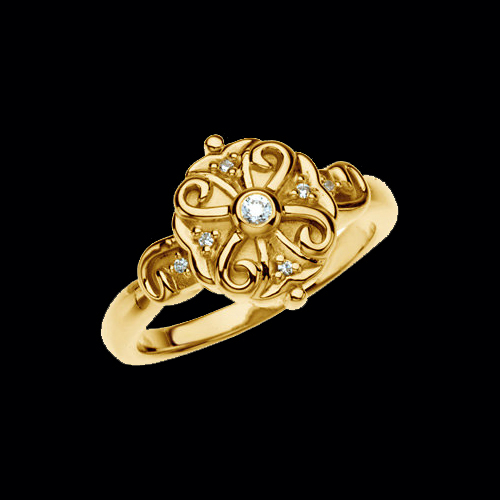 This ring is available in 14k White, Yellow, or Rose gold. 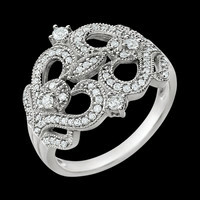 Gorgeous 14k yellow or white gold round scroll design diamond ring. 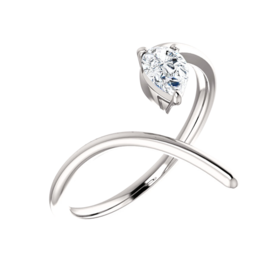 This fabulous design is available in 14k yellow, white, or rose gold and Platinum. Center bezel set diamond measures 2mm round and is accented with 6 additional accent diamonds. 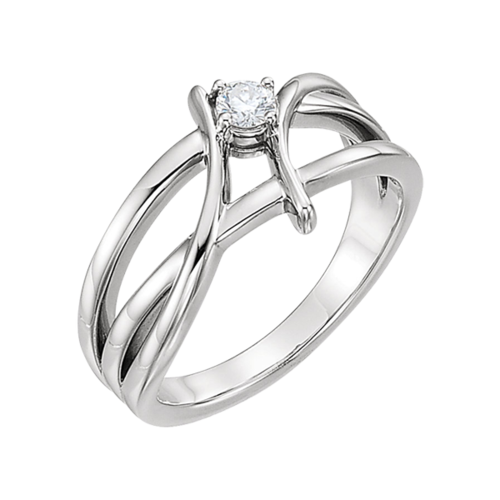 This ring is a beautiful combination of high polish and a softer mat finish. 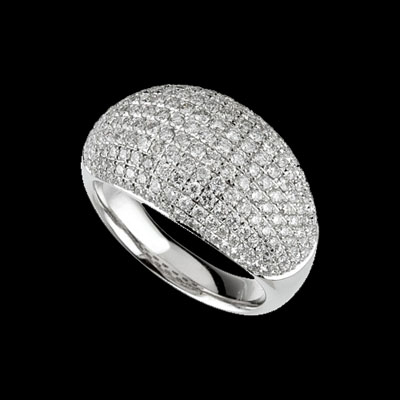 Pretty 14k white gold diamond two stone ring. Diamond two stone ring is a dainty design set with 2 .06ct round diamonds as the focal point with an additional .12ctw accent diamonds. Ring is about 6.3mm wide across the top and tapers to 1.5mm width at base. Beautiful 14k gold modern buckle design diamond ring. Diamonds total .61ctw and are vibrant SI 1 clarity G-H color stones. Diamonds are channel set and this sophisticated style is available in 14k white, yellow, rose gold and Platinum. Ring weighs about 7.7grams and meausres 11.6mm across the top then tapers to 2.5mm at the base. A lovely ring for everyday wear. Stunning Diamond buckle style ring. This great design is set with 64 SI 1 clarity G-H diamonds or upgrade to the brilliant VS diamonds. This ring is a custom made to order style and can be ordered in 14k white, yellow, or rose gold, 18kt golds, and Platinum. Ring is very substantial at 13grams in 14k gold. Measures 15.8mm across the top and tapers to 3.4mm at the base. An incredible diamond ring. Use our request email for additional pricing. 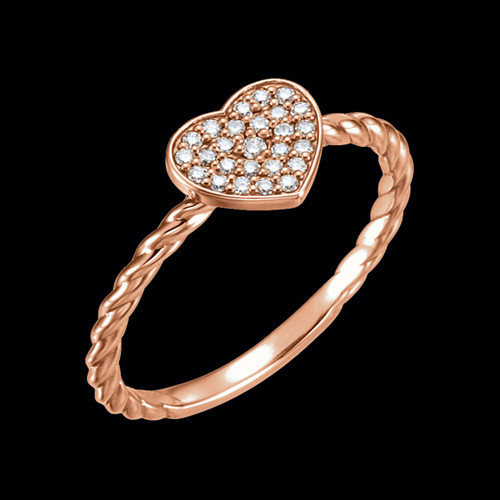 Romantic 14k gold diamond heart ring. This pretty little ring is set with 1/8ctw diamonds in a heart shaped center. Order this ring in 14k Rose gold, (as shown) 14k Yellow, or 14k White gold. Special order in Platinum. 14k White gold dainty diamond leaf ring. Diamonds total 1/6ctw in this unique nature inspired ring design. 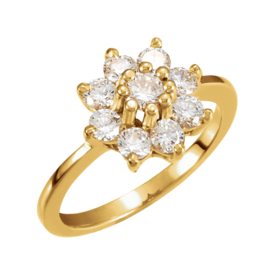 Exquisite 14k yellow, 14k white, 14k rose gold or Platinum diamond flower ring. Diamonds total 1.00ct tw in this lovely ring and are vibrant SI 1 clarity G-H color. Center diamond is 1/4 carat and surrounded by 8 3.0mm round or .10 point diamonds. Gold beads surround the center to finish this flower design. Alternate diamond weights available, email for pricing. This diamond ring is dazzling.